Dr. Viviane Stein has been providing exceptional dental care to families in Laguna Beach, Dana Point, Laguna Niguel, Aliso Viejo, and the surrounding areas in California since 1999. Known for her perceptive eye and ability to see even the smallest details in your smile, Dr. Stein takes pride in her work and finds dentistry to be a wonderful, fulfilling career. One of her favorite aspects about being a dentist is the opportunity she has to meet and converse with new people and help them improve their oral health and smile. 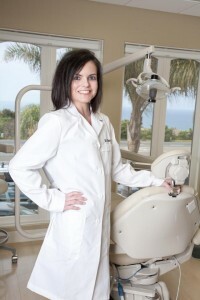 Dr. Stein writes bi-weekly articles on dentistry for the Laguna Beach Independent newspaper to help the people of our community stay up-to-date on the latest in dentistry. She also has significant research interests involving the evaluation of innovative and restorative dental technology for improved patient care. Prior to receiving her dental degree. While she has training in many areas of dentistry, including oral surgery, her greatest love is cosmetic dentistry. Throughout the years, she has been able to successfully change the lives of many of her patients who were previously unhappy with their smile and appearance. “Changing lives is truly a blessing that comes from being a dentist, and I am grateful to be a part of that process” – Viviane Stein. Dr. Stein enjoys a variety of hobbies in her spare time. Fitness is one of her passions and she loves having the opportunity to run. She also enjoys watching the latest blockbuster when she has the chance. A native of Brazil, Dr. Stein also frequently travels and most recently traveled to Turkey, where she had a wonderful time. Her favorite destinations include Cambodia and Africa, particularly the countries of Kenya, Tunisia, Morocco, Tanzania, and Egypt. Don’t forget to ask here where she’s off to the next time you visit; she’d love to tell you all about her adventures! © Copyright 2019 Viviane Stein. All Rights Reserved.